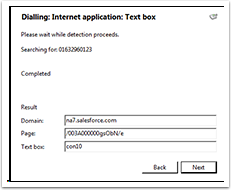 To dial out from within Salesforce CRM, dialing needs to be configured correctly. Right-click the Level365 CRM Connect tray icon in the system tray menu and then left-click the Configuration option from the menu that pops up. This will open the 'Configuration' screen. In the 'General' group, click on the Dialing option. 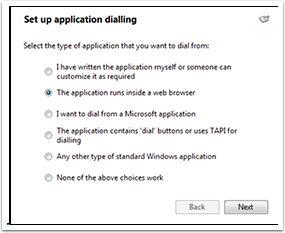 Please click here to make sure that the web dialing feature is enabled before progressing. You can refine the criteria used to identify telephone numbers. 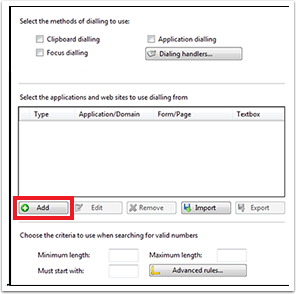 Enter the appropriate number of digits into the 'Minimum length' and 'Maximum length' text boxes and specify a prefix that identifies telephone numbers (if there is one) by entering it in the 'Must start with' box. If you would like to be able to dial directly when you are entering new information in Salesforce CRM, for example on the new contact page, we need to carry out some further configuration. Click the Add button to start the Dialing wizard. The first question in the wizard asks you about the type of application you want to dial from. Select the 'The application runs inside a web browser' option. Click the Next button. Select the 'Text boxes' option on the second screen of the wizard and click the Next button. 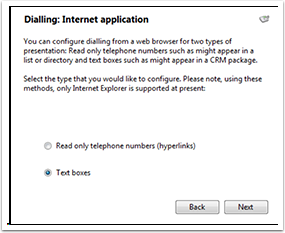 Open your Salesforce CRM account in Internet Explorer and find the text box you want to dial out from, it needs to have a number in it already so add a temporary one if you need to. Copy or make a note of the telephone number currently displayed in the text box and leave the web page open. Back in the wizard, paste or type the number into the 'Number to search for' box and click Detect. The wizard recognizes that you are setting up dialing with Salesforce CRM and asks you if you would like to use the default settings for it. These are fine for most users so click Yes. 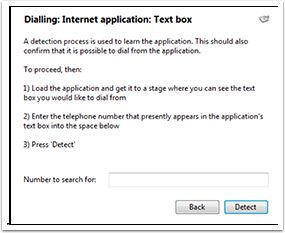 If you want to dial from a text box not included in the default settings, you will need to add it manually. Follow the instructions above starting with clicking the Add button again and working through as before but click No if asked whether you want to setup default settings. The wizard will search the current web page for the telephone number you entered and, once found, display the details. Click Next and then Close. You can add as many textboxes as you like, just start the process by clicking the Add button and working your way through again. Click Save to store your settings and you're ready to go. Now a clickable icon is placed at the end of any textboxes you have configured and you just click on it to dial the number in the textbox.